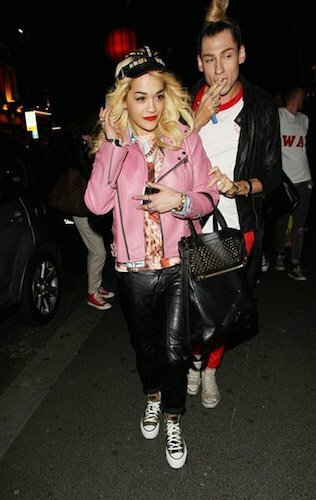 Photo gallery of Rita Ora wearing chucks. 6 Rita Ora Dancing with friends in her black high tops. 7 Rita Ora Rita wearing a pair of black high top chucks with a mini skirt. 8 Rita Ora Rita wearing black high top chucks with a silver metallic skirt. Rita Ora is a British singer, songwriter and actress. Her debut studio album, Ora, released in 2012, debuted at number one in the United Kingdom. The album contained the UK number-one singles, "R.I.P." and "How We Do (Party)". After reaching the peak position as a featured act on DJ Fresh's "Hot Right Now", Ora became the artist with the most number-one singles on the UK Singles Chart in 2012, with three consecutive singles reaching the top position. She was nominated for three Brit Awards at the 2013 ceremony.